Thomas Ferianec has created a unique infill home in the Altadore neighbourhood. 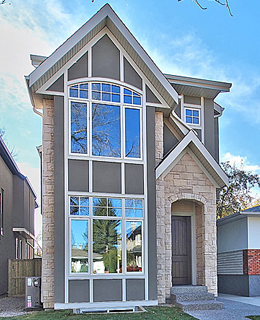 The latest project is a two-storey infill on 48th Avenue S.W. just off 20th Street with just under 2,000 square feet. The home is being built by custom home builder Stephens Fine Homes in Calgary. It is expected to be completed September 1 and will go on sale then for $1.25 million. “We wanted to design a home that would cater to a market that’s looking for something that’s more of an infill-style home but with a higher quality with features you don’t normally find in these infill homes,” said Ferianec.